Writing and publishing a manuscript in the field of nursing is a long and often daunting process, but it can be simplified by understanding the ins and outs of developing a manuscript and submitting it for publication. 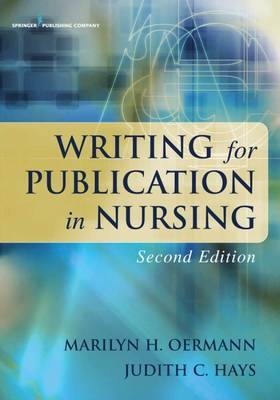 This second edition is written specifically for nurses-for beginning and experienced authors, nurses writing articles about their practice, and nursing students at all levels to guide their preparation of papers for both courses and publication. This guide gives a clear description of the entire writing process, beginning with an idea, searching the nursing literature, preparing an outline, writing a draft and revising it, developing the final product, and finally, getting published. This edition also includes new content emphasizing the importance of disseminating information on evidence-based practice (EBP). Readers will learn how to write EBP papers, report research for use in practice, and disseminate the findings of clinical projects and innovations.